We are a Benedictine School of Music committed to seeking and nurturing musical talent towards excellence in order to develop leaders with the mission to take music to greater community, thereby enriching the society. We envision graduates who are competent, creative, and compassionate musicians who can provide inspiration and direction to all people towards life-long involvement in the art of music. • are equipped with the necessary raining, knowledge and skills to use technology as an instructional tool and as a means of creating and producing music. The School of Music offers degree, non-degree, and graduate programs. The programs are “ladderized” because the student may enroll in one program and may proceed to other programs upon completion of the first one. The Diploma Program is a three-year non-degree course and the Baccalaureate Program is a five-year degree program. The graduate program offers two-year courses in Music Education, Piano Pedagogy, and Violin Pedagogy. The Bachelor of Music in Composition with Diploma in Music Composition Program equips students with the knowledge and skills to develop fully their individual creative gift so they can have successful careers as composers, arrangers, teachers, or members of other areas of the music profession. It fosters in the students individual creative ability and develops in them a broad and informed musicianship, along with knowledge of the literature of all periods. It stresses musical, technical and conceptual development as basic elements to the creative process. The Bachelor of Music in Guitar with Diploma in Music Performance Major in Guitar Program enables students to reach the highest levels of soloists, ensemble players or teachers. It gives students the opportunity to thoroughly acquaint themselves with the history, literature and pedagogy of the guitar. The Program consists of individual lessons and fingerboard-harmony classes. It requires regular training in chamber music for both mixed groups involving the guitar and for guitar ensembles including studies for guitar duos. The Bachelor of Music in Pipe Organ with Diploma in Music Performance Major in Pipe Organ develops students to perform on the pipe organ as soloist and accompanists for liturgical celebrations. It includes a strong foundation of technique and knowledge of pipe organ literature and style. 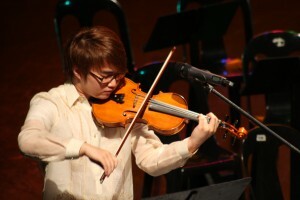 The Bachelor of Music in Violin, Viola, Cello, Bass (Strings)/Flute, Clarinet, French Horn, etc. (Winds) with Diploma in Music Performance Major in Strings/Winds Program develops skilled performers who possess a good knowledge of standard orchestral, ensemble, and solo literature for their instruments. It also enables students to possess a high degree of professional instrumental competence and to demonstrate appropriate stylistic approaches in the performance of both solo and ensemble music from the various periods of music history. The Bachelor of Music in Violin with Violin Pedagogy Emphasis Program develops skilled performers who possess a good knowledge of standard solo, orchestra and ensemble literature of their instrument. It enables students to possess a high degree of professional instrumental competence to demonstrate appropriate stylistic approaches to the performance of both solo and ensemble music from the various periods of music history. It puts emphasis on violin pedagogy which trains and equips students with the Suzuki Teaching method for children of various ages. The Bachelor of Music in Voice with Diploma in Music Performance Major in Voice Program prepares students to become technically proficient, knowledgeable and intelligent singers. It is directed toward the development of every aspect of the vocal art including vocal and choral technique, diction and foreign language. It exposes students to the performance of song in every form: art song, chamber music, oratorio, opera, and choral/symphonic literature. The Bachelor of Music in Music Education with Piano Principal Program develops music teachers for the elementary and secondary schools. 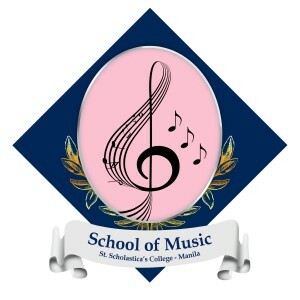 It trains music education majors to be solo and chamber performers of their principal instrument, since SSC School of Music is a performance-oriented school. It equips students with skills and technique in teaching the instrument and in accompanying and conducting choral and instrumental ensembles. The Bachelor of Arts in Music Production and Technology with Diploma in Music Production and Technology Program prepares students to become composers, arrangers, and production managers, sound engineers in recording and directors in a musical production for the music industry. It provides training and exposure in music production for various media. It also includes the use of technology in music production. Bachelor of Music Major in Piano with Diploma in Music Performance Major in Piano/Bachelor of Music in Piano with Piano Pedagogy Emphasis Program fosters the development of students who perform a high level as soloists and who possess a strong foundation of technique and knowledge of piano literature and style. 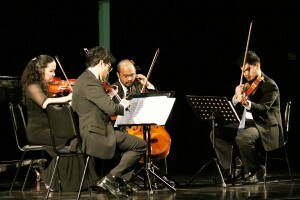 It enables students to evaluate teaching methods, to learn how to build technique and musicianship, and to analyze and perform a large sample of solo, duet and chamber music repertoires.